(Nanowerk Spotlight) Skin thermal burns are a complex and major source of morbidity, mortality and healthcare expenditure in the United States, with 486,000 patients treated for burn injury each year. Given the range of causes, from fire associated injury to water scalding, patients often present with multiple and complex burns – wounds that often worsen and expand over the first few days due to the associated underlying inflammation and injury. "Though the impact of these injuries is large, our current treatment armament falls short, with gold standard treatments lacking evidence to support their use, or even worse, delaying wound healing as was recently elucidated with silver sulfadiazine," Dr. Adam Friedman, Associate Professor of Dermatology and Director of Translational Research at the George Washington School of Medicine and Health Sciences, tells Nanowerk. To address this gap, Friedman and colleagues at the Albert Einstein College of Medicine utilized a unique nanotechnology that can both release the potent biomolecule nitric oxide (NO) over time, as well as facilitate nitrosation, the addition of an NO group to a biological molecule, which is central many of NO’s activity. The team reported their findings in Journal of Drugs in Dermatology ("N-acetylcysteine S-nitrosothiol Nanoparticles Prevent Wound Expansion and Accelerate Wound Closure in a Murine Burn Model"). "The role of nitric oxide in wound healing is well established through all three phases," says Friedman. "Both NO itself and the act of nitrosation are exceedingly important in the transition from the inflammatory phase to the proliferative phase of wound healing. Therefore, we created a system that can do both." The scientists evaluated a previously described S-nitroso-N-acetyl cysteine containing hydrogel-based nanoparticle platform (NAC-SNO-np) on in vivo burn wound closure, expansion and inflammation in a multi burn model. 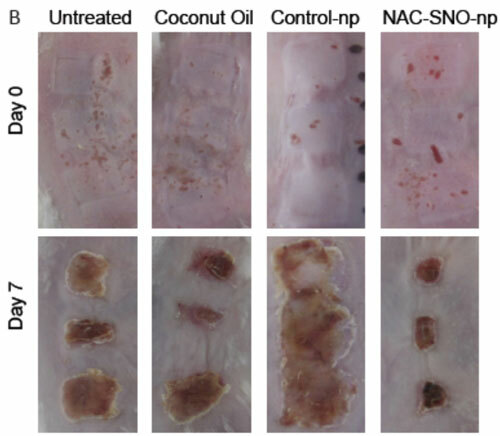 Burn wound expansion in the NAC-SNO-np in coconut oil treated group was significantly attenuated compared to untreated control, coconut oil, and control-np groups. The clinically observed acceleration of wound healing was matched with the histologic evaluation of the burn wounds, with the NAC-SNO-np treated groups showing less persistent inflammation, more maturation, and healthier new tissue as compared to the other groups over time. While still in its infancy, Friedman believes this technology will be brought from bench to bedside as it has been licensed by the company Nano Biomed Inc.
"The reality is, many impressive technologies fail to launch because the business and financial element aren't nurtured," says Friedman. "Nanotechnology in general has extraordinary potential to change the face of medicine, but it is unfortunately not enough to just have a good scientific basis or data." "Along this theme, it is in fact only through the unique structure of the nanomaterial herein investigated that allows for the generation of nitric oxide and confers the nitrosation capacity offered by the NAC-SNO-np," he concludes.